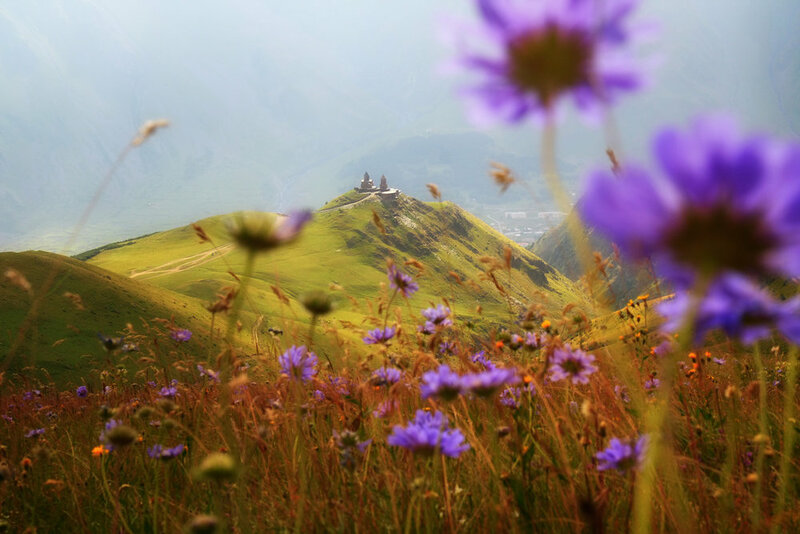 Wedged snugly between Europe and Asia, bordered by the Black Sea and the towering peaks of the Caucasus, Georgia is a fusion of influences from East and West but retains a culture unlike any other. Falling away from its snowy spine is a surprising tapestry of rumpled green hills, uncurling rivers, and golden vines. With its ancient heritage, a choice of mountains or sea, and a reputation for superb wine, feasting, and unfailing hospitality, Georgia is a rewarding destination for every traveler. Walkers, climbers, and skiers will want to explore the mountains, forests, and traditional villages. The rivers are perfect for fishing and rafting while botanists and bird-watchers will be captivated by the incredible diversity of plants and wildlife. But Georgia is also famed for its beautiful churches and fortifications, from honey-colored monasteries decorated with frescoes to cave cities hollowed from the country's backbone. And the polyphonic singing simply must not be missed. Georgia is a land unspoiled, uncrowded, and waiting to be discovered. The Bagrationi (also known by Bagrations) dynasty is one of the oldest Christian-ruling royal families in the world, dating back to the Middle Ages. Due to Georgia's political turbulence, the royal family holds little political power today. However, their family heritage has lived on with members of the royal family currently residing in Tbilisi. Nomad Hill has exclusive connections with the family, and can provide access to the wonderful family. The Georgian culture prides itself on the traditional foods and dance that often occur during a feast called supra. While attending a supra, the toastmaster, or locally known as tamada, plays the important and honored tradition of blessing the meal, keeping that guests entertained with song and dance, and ensuring all guests go home peacefully. Attending a supra is an honor and a highlight for most guests. Tbilisi is the capital and the largest city of Georgia. It was founded in the 5th century AD by Vakhtang Gorgasali, the Georgian King of Kartli (Iberia). 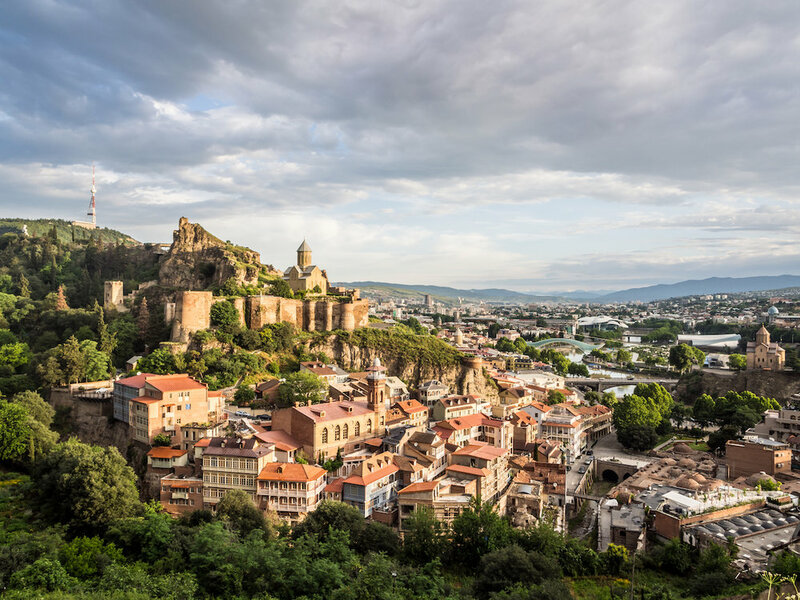 This experience is best served by visiting the old part of Tbilisi, which is abundant with historical monuments and districts such as the Narikala fortress, monument of Mother of Georgia, and Metekhi plateau. Next visit to Georgian museum, which houses a unique collection of natural and human history, with animal remains dating back 40 million years, and rich archaeological and ethnographic collections from the Paleolithic, Neolithic, Bronze, Iron and Middle Ages. Wine is more than just the drink of choice in Georgia.. Behind every glass comes a story, a traditional means of creating the wine, and process in which to indulge. A truly remarkable and authentically Georgian experience, wine making lessons and historical tours are not to be missed. Built in the 14th century and situated in the hills near Mount Kazbek, follow a guide along a stunning hike to reach the church. This hike offers unforgettable views of Mount Kazbek, reaching 5047 meters and covered with glaciers and permafrost. This is a highlight for most visitors of Georgia. According to legend, the titan Pkharmat (often referred to as "Prometheus" by the Greeks) brought fire to men was chained on the Mount Kazbek, allowing them to live a more sophisticated lives. This helped unite the people and create the nation of Georgia. Rooms Hotel resides in the charming Vera neighborhood of the capital city of Tbilisi. An instant hotspot, the property is the city favorite for local business elite and diplomatic communities as well as the capital’s burgeoning fashion, art and culture crowd. The urban location has also emerged an international draw for Tbilisi itself as a destination, as well as the home for the city’s most sought-after restaurant reservation, bar scene and conference and meeting facility. Luxury and Wellbeing in perfect harmony…Rixos Borjomi offers outstanding comfort and luxury to its guests, in one of the most famous cities of Georgia. Nestled just outside of the city center, Rixos Borjomi offers guests the perfect blend of opportunities for adventure and relaxation with superior quality. Here, guests will have a pampering experience beyond expectations with many amazing suite options to choose from and stunning views of the surrounding area. Boutique Hotel Kabadoni is located in the historical center of Sighnaghi. Its exceptional location is beloved by visitors to the town. 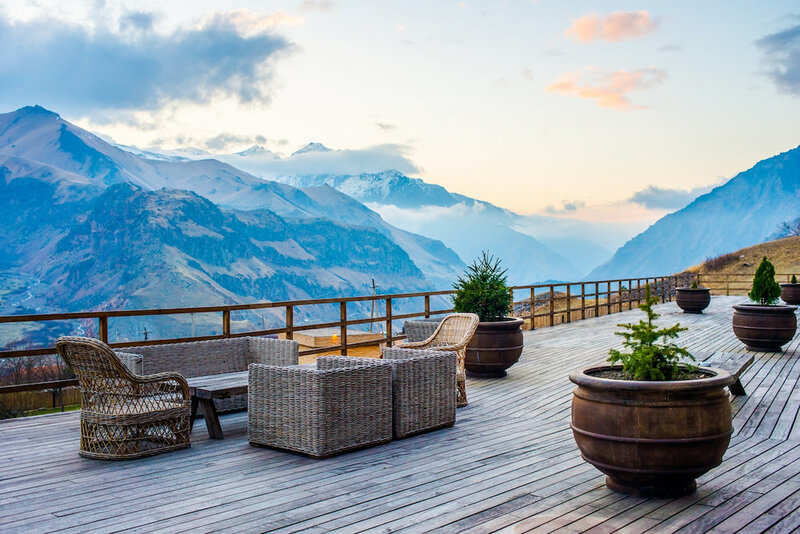 One side of the hotel overlooks vineyards scattered throughout the Alazani Valley and the Caucasus. The other side reveals the town’s historical center. The interior of Hotel Kabadoni is a mixture of art nouveau, ancient Georgian, and eastern motifs, creating an atmosphere purely Georgian in character and provides an especially enchanting feeling.